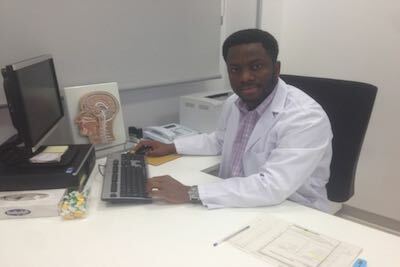 NNAMDI C. ELENWOKE is a neurosurgeon based in Basque, Spain. He works in a hospital in Santiago Apostol, Vitoria-Gasteiz, Spain. In this interview with ODINAKA ANUDU, he speaks on brain drain, medical tourism and why Nigerian doctors in the Diaspora are not interested in returning home. Indeed, brain drain is a legitimate concern for any country. Naturally, humans tend to move to better places to fulfill their needs or desires. This has always been the case throughout history. An interesting research by NOI polls published in August 2017 indicated that Nigeria has about 72,000 medical doctors registered with the Medical and Dental Council of Nigeria, with only approximately 35,000 practicing in Nigeria. About 20,000 medical doctors are currently working outside the country. It is also important to note that patients also emigrate as well. Also in August 2017, the president, Healthcare Federation of Nigeria, HFN, Clare Omatseye, mentioned that a total of $1 billion is lost annually to medical tourism in Nigeria. If you want to solve this problem you have to tackle the root cause of brain drain. What caused your exit from Nigeria? I left the country because I was part of the 100 Nigerian students selected by the then President Obasanjo’s government to study medicine in Cuba. Upon completion of the study, I, together with the others, came back to be absorbed into our medical system and to give back to my country. Unfortunately, inadequate and slow integration into the medical system made this move impossible. Also, I saw the need to get specialist training and going outside was the better option. I had to go on to study Family Medicine and later pursued another medical specialty, Neurosurgery, in Spain. Regardless of the difficulties of integration, I have been coming in and out of the country to collaborate with other medical agencies on how to bring sustainable healthcare to our people. Your area of specialty is conspicuously low in Nigeria, how can the Nigerian government resolve this among others? The needs of neurosurgeons in general are not too different from most highly specialised medical professionals. A good economic condition will make most professionals to return. Preference should be placed on our health sector so that necessary provisions will be made to enhance our health systems. According to Trading Economics, historically, our health expenditure is less than 5 per cent of our GDP, contrary to the Abuja declaration of 2001. Policy makers usually allocate more to sectors that will increase revenue. It means that the health sector is yet to become top priority in allocation. Health is wealth. If necessary facilities are put in place in Nigeria, will doctors in Diaspora return home? This is true to an extent. Sustained increase in generated revenues in a transparent society increases government spending on other sectors like health. There is a bilateral long-run relationship between economic growth and health expenditure. This is neither easy nor impossible. It involves organised planning and dedicated action. I believe that when most people in the Diaspora observe upgrades in infrastructure and security, they will decide to come back and stay. A worker is more productive in a conducive and safe environment. Although brain drain can increase a country’s inflow of hard currency through remittances or increase the culture popularity like Nigerian entertainment sector, the disadvantages to a nation far out-way the advantages. My priority is to come back and stay. I am aware that there are limited number of Neurosurgeons in our country, and the need for neurosurgeons out way this limitation. Some doctors in the Diaspora have developed means of working from their resident countries. Some are doing great works that involve transferring knowledge or exporting medical equipment to Nigeria. I am part of Docotal Health, a medical company with consultants comprising mostly Nigerian doctors within and outside of the country, who provide online solutions to medical problems. The Docotal Health Foundation seeks to provide medical equipment and facilities to various agencies as well as services to communities. The world is now a global village and we are in the information age. We are using every available channel to avail our people with health services. Why the decision to become a medical doctor? Since I was a child, I have always had interest in helping sick people. I remember the first day I went to visit my aunt in the hospital and I saw all the sick people in the hospital. I fell in love with the hospital. Also, I love to know how the human body functions. This inquisitive nature has made me to continue studying hard till today. Do you think that medical practitioners in Nigeria are properly paid? The wages, although very important, is not only what makes a doctor to stay in a country. Though low wages can cause frustration, availability of necessary functional infrastructure and respect for the profession can encourage doctors to stay and do their best. Interestingly, doctors are amongst the highest paid workers in their respective countries including Nigeria. However, average doctors’ wages in our country are low in comparison to their counterparts in many other countries. Medical tourism is on the rise, can the return of specialists like you curb the trend? This is not what one can do alone but requires teamwork. Many people are already doing a great job. For example, Douglas Okor of Spine Fixed in Abuja (SFIA) and his team are doing a wonderful job. Naturally, medical tourism will decrease when there is trust from the citizens. I mentioned before that I am actually working with Docotal Health. Some of the consultants are in the Diaspora. The other part of it is medical foundation whose vision is a prioritised sustainable healthcare for the vulnerable and the aged. We have a fantastic team working with other organisations and hospitals to help Nigeria achieve all the United Nations Sustainable Development Goals. If other medical personnel in Diaspora will keep thinking homeward, there is no quantifying what health success we will achieve in our country. I am willing and ready to work with our companies and hospitals on contract to achieve this success. What other message do you have for the government, Nigerians as well as your friends back home? The government is trying her best. It is not easy to rule a nation of more than 190 million with a large number of varied ethnic groups, where ethnocentrism seems more important than nationalistic values. The general population doesn’t understand how the government works. Policy making can become difficult where you do not understand your neighbour. If you don’t understand your neighbour, then prejudice and lack of trust will have a way. Trust is fundamental in an effective team. Friends and well-wishers back home should understand that we are doing our best to achieve this dream. It is a gradual process that requires all hands being on deck. John Nash, the American mathematician, once said that the best for the group comes when everyone in the group does what’s best for himself and the group.